First of all, I’ve never really tried Indonesian and my foray in to it by a good friend of mine (hat tip BT) was more than I could ever hope for. Location: 186 King street, Melbourne 3000. You know what I have to just cut to the chase. The food was served so fast that I thought that the quality was going to be compromised. But no. This was by far the most delicious meal that I had. 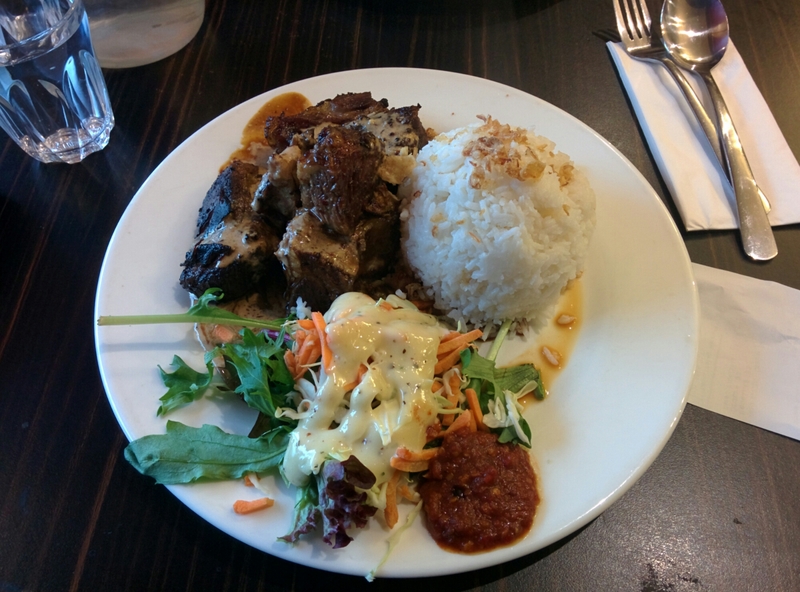 The grilled beef ribs with steam rice, sambal and salad was so so so SO delicious. Even now, I can taste the food coating in the back of my throat and the smells are making me drool. Nothing can prepare you for it. Seriously. I thought I would not be full, but by the end of it, I was filled to hilt. And the price? $12. Do yourself a favour, just go there and you won’t be disappointed. I’m so excited that I have to give this place a resounding 5/5. And it’s a one man kitchen. The efficiency of a well run operation just swelled my heart with pride. A few places, across multiple industries could learn a thing or two from this restaurant. A one man kitchen? Seriously?! Wow! I’ve never really known where to go to try Indonesian food, so good to get this tip! You need to go here. Even when it’s busy. Average wait time is around 10 minutes, if that. You will enjoy yourself. But be weary of the sambal. It is as potent as they say it is….